Around noon last week, riders waiting at the McFadden Avenue bus shelter adjacent to Main Street in Santa Ana were sitting in the sun, despite the shelter’s roof. Other riders stood nearby in the shade of a building. Sitting on the bus stop bench, Maria Munoz’s son hid beneath his mom’s hoodie to shield him from the sun. While the added roof shade is an improvement, said Munoz, she wished it gave more coverage. “It needs to be over here,” she said waving her hand over her shoulder. 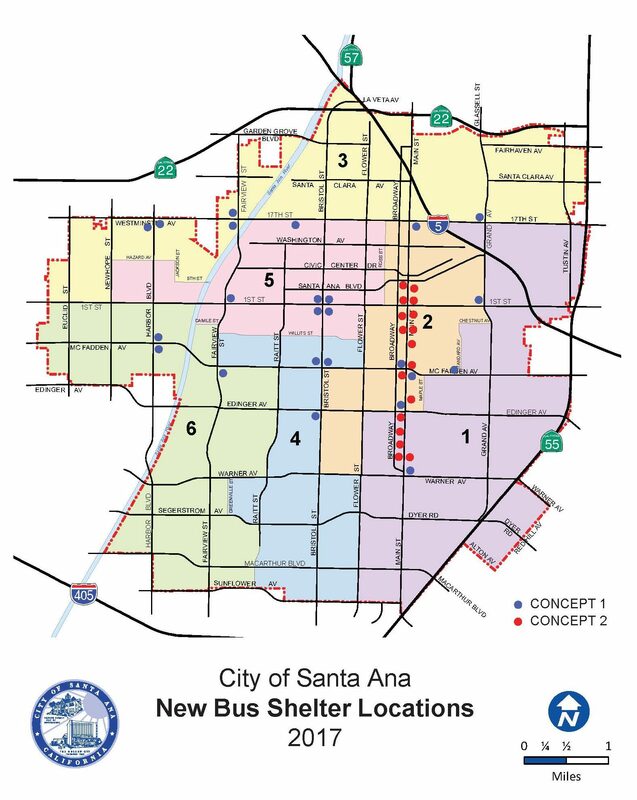 Santa Ana Public Works Agency has been at work installing 41 new bus shelters around the city, providing shading and seating for people waiting for the bus. Of the more than 600 bus stops in the city, these additions would bring up the total number of bus shelters to more than 170. Santa Ana is funding the improvements from a number of sources, including a portion of $1.2 million that the Orange County Transportation Authority gave to Orange County cities to make improvements at 51 of the 100 busiest bus stops in the county, as determined from average daily weekday passenger boardings. More than half of these stops are located in Santa Ana. In addition, twenty-nine of the shelters are being funded with $687,519 from OCTA’s Measure M half-cent sales tax. Anaheim, Brea, Costa Mesa, Irvine, Orange, and Westminster were also awarded funds for similar improvements. Twelve stops are being installed in the South Main corridor using $552,000 from the area’s former redevelopment agency. The city also used $200,000 from its general fund to fill a shortfall in the project costs, said Suzi Furjanic, an associate planner for Santa Ana. Once completed–expected to happen by the end of December–the 41 bus shelters will have cost roughly $1.4 million. Working within the constraints of limited funding, city staff have been looking for ways to be creative about adding more shelters, not just replacing old ones. One way has been to make sure bus shelters are included among any improvements made on a street that has a bus stop. “We’re not going to be able to count on a windfall of money coming in. We’re going to have to probably look at a number of ways” to build more shelters, Furjanic said. Furjanic, who served as designer and project manager for the improved bus stops, designed two prototypes: one for South Main and another for the rest of the city. As the city started to work on the shelters, the team revisited portions of the South Main Vision Plan that called for adding bus amenities on specific stops along South Main Street. The plan, which included input from residents and business owners in the corridor, described community interest in making bus stops that had cultural relevance to the area, specifically its Mexican population. This is reflected in the design for the shelters on South Main Street, which have multicolored paneling on the partition and red roofing. The decorative panels are inspired by Mexican papel picado, and include a subtle outline of the Santa Ana water tower. The shelters’ LED lighting is powered by solar panels attached to the roof. Real-time boarding displays are being planned for the future. The design also has to be very sturdy, Furjanic said. In the past five years, the city has lost thirty bus shelters when car drivers crashed into them. Older shelters are decaying from exposure to weather over time. The new design should help them last a little longer by elevating the trash cans and seating so their supports don’t rust from sprinkler runoff or rain, as happened with the old shelter design. That is especially a problem with the older trash cans, because the rust can carve holes at the base, causing trash to leak out. Bus riders so far have appreciated the new seating and shade, although reviews have been mixed. Felipa Camacho, a 33-year-old Santa Ana resident, was waiting at a Main Street bus shelter not far away. Camacho, who uses the bus to get to and from work and home, said she liked the shelter. She said that in the past she would have to seek shade beneath nearby trees. Esperanza Vega, 56, who was waiting at the South Main Street bus shelter near Edinger Avenue, said that she felt safer with the lighting, since she frequently has to wait at night by herself at bus stops, and the old shelters have at best poor lighting. I think the way they designed the trash cans are kind of fucked up. Everyone knows that the homeless grab cans from the bus stop trash cans and they obviously made the hole to the lid tiny as to deter that. Who are they hurting by taking soda cans so they may recycle them?